Apple today announced a new pair of wireless "AirPods," which provide up to 5 hours of music playback and high-quality sound through a "seamless and automatic connection" between devices. The AirPods include a rechargeable battery case that delivers up to 24 hours of battery life. The AirPods connect instantly with a single tap and switch between iCloud-connected Apple devices on the fly. Playback is controlled by dual-optical sensors that "know when you are listening" and will pause music automatically when taken out. A double tap on the buds invokes Siri, allowing the user to select and control music, change the volume, check battery life or perform any other Siri task. This functionality is enabled by an ultra-low power Apple W1 chip inside, which also delivers higher quality audio, claims Apple. "AirPods are the first headphones to deliver a breakthrough wireless audio experience, and with the new Apple W1 chip they deliver innovative features including high quality sound, great battery life and automatic setup," said Philip Schiller, Apple’s senior vice president of Worldwide Marketing. "AirPods are simple and magical to use, with no switches or buttons, automatically connecting to all your Apple devices simply and seamlessly, and letting you access Siri with just a double tap. We can’t wait for users to try them with iPhone 7 and Apple Watch Series 2." Each AirPod also has an additional accelerometer that detects when the user is speaking, while a pair of beam-forming microphones focus on the sound of the user's voice and filters out external noise. 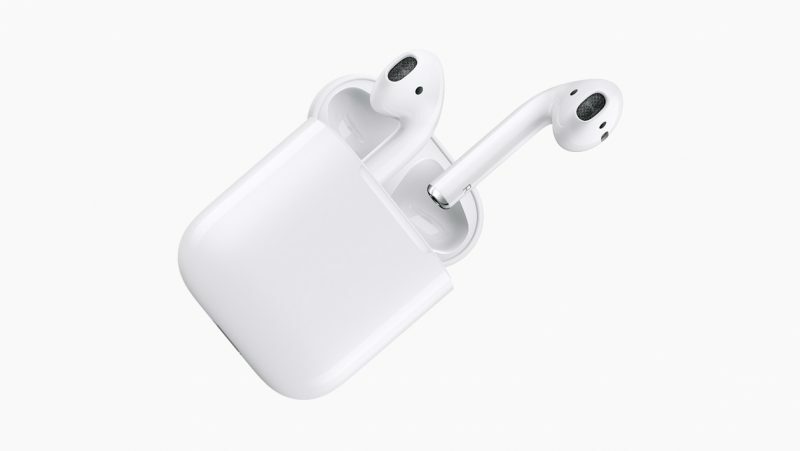 The AirPods come with a Lightning cable for charging the case, and will be available to buy from late October in stores and online at a price of $159. The earphones require Apple devices running iOS 10, watchOS 3 or macOS Sierra. The company also showcased a pair of new, lightning-connected EarPods at the media event in San Francisco. These wired headphones will be included in the box for the iPhone 7 and iPhone 7 Plus, along with a Lightning-to-3.5mm headphone adapter. Based on the comments and complaints I assume most people aren't familiar with the average price and battery life for this type of product is. 5 hours of battery life and $149-$159 or whatever it is, is actually very very good. Guys, it's 5 hours of continuous playback. If you put them in the charging case when you're not using them, you can get 24 hours of playback. Not saying it's the best but it does seems manageable. I'll definitely check them out when they launch but I'm worried they won't be comfortable. They look just like the EarPods and those things are uncomfortable as hell. 5 hours is useless, I work 9 hours and need 12 hours per day...... I'd rather the 3.5mm jack, I don't need stereo speakers built into the phone, I don't even need one speaker, they're small and crap and I only ever have my phone in vibrate... I never use the built in speakers. They look cool, but also look like they'll fall out with any sudden movement. Exactly everything I was hoping for. 5 hours of continuous listening is generous. The case extends that to 24hours. The $159 price is surprising. I thought they'd be much higher. Many wireless earphones are up around $300. They're beautiful and are built for Siri. I'm in. 15 minutes in the AirPod case gives them 3 hours of use. That's pretty good. I gotta say, these caught my attention more than anything else so far. I'm a little disappointed at the 5 hours of battery life, but the battery case was a great idea.